I was 1st introduced to this style of cooking scallops in HK. I really like how yummy they taste! It’s really easy and the whole process takes less than 15mins. 1. Soak the vermicelli in cold water for 8-10mins. 2. Roughly cut the vermicelli with a scissors, about 3-4 times. 3. 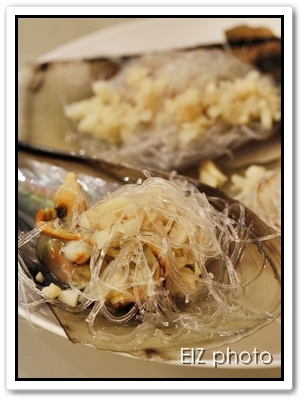 Divide the vermicelli among the scallops. 4. Heat up 1 tbsp of oil and pour over the garlic. 5. Season the garlic with a dash of sesame oil, soy sauce and pepper. 6. Put the garlic on top of the vermicelli. 7. Boil a pot of water. Steam the scallops on high heat for 3 minutes. This is another method of cooking fish. I particularly like how well the sauce goes with plain rice. If you are too busy to cook but yet crave for a home-cooked meal, this is the way to go. 2. Steam the fish for 8mins. 3. Heat up the oil in a pan on medium heat. 4. Brown the garlic, scallion and ginger. 5. Add the soy sauce, sesame oil and shaoxing wine. 6. 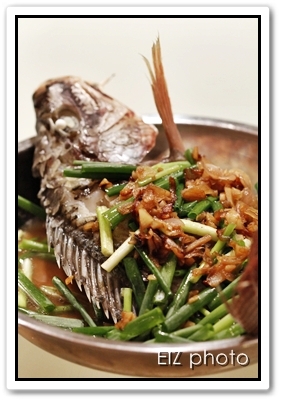 Once the fish is ready, pour the sauce over the fish and garnish with spring onions. I love to eat steam fish especially after I move to Hong Kong as the fish here is very fresh. If you go to the market, there are fish that are still alive and they are killed only when you buy them. 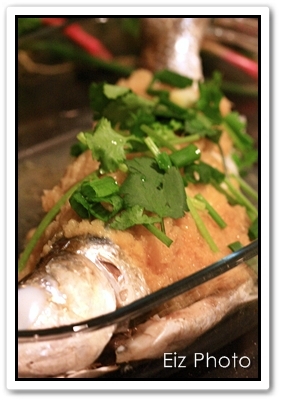 One of my favourite ways of cooking fish is with ginger sauce. Yums! 1.Using a food processor, process the fresh ginger and water till very fine texture. 2. Pour into a wok then add in the rest of the ingredients for the ginger sauce. Cook till boiling point, lower heat then add in cornflour water. 3. Dish up and set aside. 1. Before steaming, insert 2 stalks of spring onion into the fish. 2. Steam fish on high heat till cooked (10 to 12 mins). 3. Remove fish and pour away water. 4. Pour ginger sauce and sprinkle fried garlic over fish. 5. 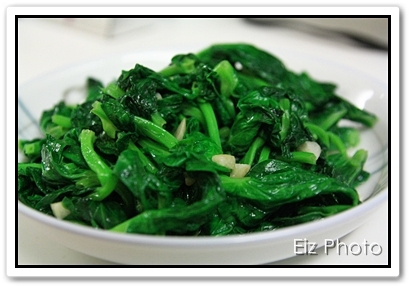 Garnish with spring onion and parsley. Serve immediately. This is another recipe which I picture in my head before heading to the kitchen. 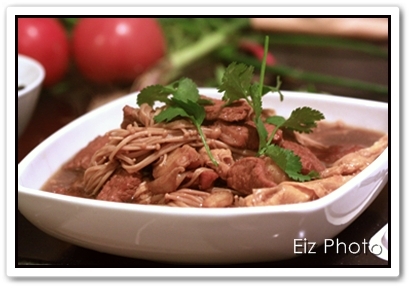 It tasted a bit like babi chin but also a little bit of bak kut teh influence. Can’t decide on the name of this dish so I came up with “Bak Kut Chin”. It has quite an interesting taste. Try and you might like it. The mistake I made was to use all lean meat. Maybe a mixture of pork belly and lean meat would be better or perhaps pork ribs. 1. Mix pork with the seasoning and put aside. 2. Heat up the pan with oil and stir fry the garlic for 1 min. 3. Add the ground cumin, white peppercorn and star anise. Stir fry for 1-2mins. 4. Add in the pork and stir fry for 2mins. 5. Add in dark soya sauce, oyster sauce, light soya sauce, sugar and pepper to taste. 6. Add in the bak kut teh sachet and water. Bring to boil. 7. Cover and reduce heat to simmer for 15-20mins. Stir occasionally. 8. 5 mins before serving, add in the golden mushroom and beancurd sheets. Simmer. 9. Dish up and serve hot. When I was in Malaysia, I only knew one kind of ‘tau miu’ – which looks like this. But when I moved to Hong Kong, I found there’s another ‘tau miu’ and it’s leafy. I tried to google to see the difference in terms of the English names. If I am not mistaken, the Msia ‘tau miu’ is called sweet pea sprout while the HK one is sweet pea shoot. I like both types but the one in HK is seasonal. I was very happy to see them in the market today. 1. Rinse and drain the tau miu. 2. Heat the oil in a wok. 3. Saute the chopped garlic till fragrant. 4. Add the tau miu, salt and sugar. Stir fry 2-3mins. 5. If the vegetables are too dry, try adding a few drops of water while stir-frying. 6. Dish out and serve hot with rice. 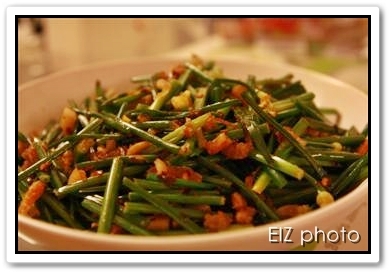 Recently, I grown to like “Gao Choi Fa” (韭菜花) also known as the Chinese leek. It tastes like spring onions but sweeter and crunchier. I bought some few days ago and thought maybe I’ll cook it for dinner so this is my own recipe. 1. Heat oil in a frying pan/wok. 2. Add garlic and stir fry till light brown. 3. Add the dried prawns and stir fry for 1-2minutes, till fragrant. 4. Add in the chinese leek. 5. Add in the sugar, salt, pepper, soy sauce, chili and water. 6. Stir fry for 1-2minutes. Do not stir fry till it’s too soft or it will loose the crunchiness. 1. Heat up the wok or frying pan with oil. 2. Add in the shallots and stir-fry till fragrant and light brown. Make sure it’s not over-fried or it’ll leave a bitter taste. 3. Add in the uncooked rice and salt. Stir-fry till it’s mixed well. 4. Scoop the rice into a rice cooker and cook like how you normally cook plain rice.